ASHEVILLE NC – Students entering 7th through 12th grade are invited to a free, three-day summer camp offered by Southeastern Sports Medicine and Park Ridge Health. The 3rdAnnual Student Athletic Training Camp will take place July 22 – 24 from 7 – 10 p.m. at Southeastern Sports Medicine’s Hendersonville facility. Students with an interest in entering the fields of athletic training, physical therapy or sports medicine are highly encouraged to take advantage of this opportunity, where they will learn the fundamentals of athletic training including basic anatomy, taping techniques, first aid and hydration. “Students who complete this three-day course can benefit their schools’ athletic programs by being an extra set of eyes and hands, and also gain knowledge and experience to help them succeed in what is now a very competitive field of health care,” said Dwayne Durham, Director of Southeastern Sports Medicine Hendersonville. To register for Student Athletic Training Camp, please call 692-1333. About Park Ridge Health: Park Ridge Health was built by Henderson County residents, and more than 100 years later is a beloved piece of our growing community’s health care network, providing quality, compassionate care in a Christian environment. In 1986, Park Ridge Health partnered with Adventist Health System, joining a family of 43 exceptional not-for-profit community hospitals across the country. Leading the way in many medical firsts for the region – including a boutique baby delivery experience and North Carolina’s first 64-slice CT scanner in 2006 – Park Ridge Health provides personalized care throughout the region, offering a dedicated network of more than 130 primary care and specialty providers, cardiac care and rehab, state-of-the-art surgical care, nationally awarded cancer services, full-service orthopedic care and the only accredited hyperbaric medicine facility in Western North Carolina. For more information about Park Ridge Health or to find a physician, please visit www.parkridgehealth.org or call 855.PRH.LIFE (855.774.5433). ASHEVILLE NC – If one really wants to see the heart of Lake Junaluska’s beginning, then take the Tour of Historic Homes, presented by the Junaluska Woman’s Club, the oldest club at the Lake organized in 1917. Each of the four homes and one lodge is located on Atkins Loop, named for “founding father” Bishop James Atkins. Local historian and resident Bill King described Atkins Loop as ” holds the footsteps of the original residential area of Lake Junaluska”; all were built between 1913 and 1917. The homes on the tour are: 334 Atkins Loop (C. E. Weatherby Sr. home was the 1st built in 1913)now owned by Mrs Virginia McNair, 232 Atkins Loop(original home of Irby Roland Hudson) now owned by Dan & Louisa Suggs, and 158 Atkins Loop (originally the Maffitt home) now owned by Neil & Norma Jean Dobson for over 40 years and has the original chestnut woodwork & floors, river rock fireplace and furnishings which include the bed in which Eleanor Roosevelt is said to have slept. Continuing the tour with 120 Atkins Loop, (the 1914 home of Dr William Quillian, then the superintendent of the Methodist Training School for Missionaries in Nashville, TN.) where present owners, Art and Betty Swarthout, only the 3rd owners have lived since 1972.and where Eleanor Roosevelt sat on the porch and had tea. Also included is the Providence Lodge at 49 Atkins Loop, (built by C. E. Weatherby in 1915) and is owned by Carol Clark and still used as a lodge for guests at Lake Junaluska. The tour also includes Weatherby Park, just across from Atkins Loop, which has been refurbished with new greenery and benches by the Junaluska Woman’s Club, and a new picnic table by the descendants of C.E. Weatherby, who built the first house at Atkins Loop. The Junaluska Woman’s Club first dedicated the park to Weatherby in 1923. Some of his descendants will be on hand for the park’s rededication in honor of the Lake’s Centennial. Current owners of the homes and lodge will be on hand during the tours to provide historical facts. Shown in picture is Margaret Fowler McCleskey as Nyla Weatherby in the garden. Refreshments will be served at the end of the tour. Visitors may walk the loop or ride in a van. This is a walking tour and comfortable shoes are recommended. Park at the Chapel parking lot down by the Lake and the trolley will take you to Atkins Loop. Tickets $10.00 are on sale and may be purchased at the Bethea Welcome Center or at 334 Atkins Loop on the day of the tour. ASHEVILLE NC – Chimney Rock won the platinum award for Favorite State Park in Blue Ridge Country‘s 2013 Best of the Mountains poll, which covers seven southern states in the Appalachian Mountains. Readers awarded the park three more platinum honors for Best Hike to Take the Dog Along, Best Birding Area and Best Beautiful Fall Foliage Spot. Chimney Rock was also awarded three golds for Best Hiking Trail (non-AT), Best Scenic Photo Opportunity and Best Waterfall. For upcoming live music, guided hikes and signature events, visit Chimney Rock’s online events calendar. “Chimney Rock has a lot of longtime, passionate fans and friends that eagerly shared their feelings to help earn these impressive honors. These awards are really about our fans throughout the country and their love and support for this beautiful mountain paradise in Western North Carolina,” said Mary Jaeger-Gale, Chimney Rock’s general manager. Held only every five years, the Best of the Mountains poll features a variety of reader-selected awards, from best waterfall to best southern cooking. Ballots produced almost 250 platinum, gold and silver awards for cities, attractions, people and activities in the Blue Ridge Mountain region. Winners can be found in Blue Ridge Country’s online 25th anniversary edition. Chimney Rock at Chimney Rock State Park is one of the Southeast’s most iconic and popular international outdoor travel destinations and has been for more than 100 years. Known for its stunning 75-mile views overlooking Lake Lure, Chimney Rock’s unique hiking trails, guided rock climbing, live animal education programs and ancient geological features attracts visitors from around the world. It’s the only state park in the Southeast with an elevator inside a mountain. Chimney Rock is located only 25 miles southeast of Asheville, N.C. and 95 miles west of Charlotte on Highway 64/74A in Chimney Rock, N.C. Call (800) 277-9611 or go to chimneyrockpark.com to plan your visit. ASHEVILLE NC – The Galaxy of Stars Series at Western Carolina University celebrates its ninth season with a lineup that will take audience members from the Beatles’ 1964 U.S. invasion to “Smokey Joe’s Café” and many points between. The only professional entertainment series in Jackson County, the Galaxy of Stars Series debuted in 2005, with all performances taking place in the 900-seat John W. Bardo Fine and Performing Arts Center. Series subscriptions are now available at a substantial savings over individual ticket prices. Patrons can enjoy all six shows in the season for $100 for adults and $25 for students and children. Subscriptions allow patrons to select and keep preferred seats and also are an affordable way for families to enjoy live entertainment. – “Ring of Fire – The Music of Johnny Cash,” 5 p.m. Sunday, Nov. 24. Touching on the life and times of one of the world’s most legendary artists, “Ring of Fire” is a top-notch “jukebox musical” revue. A company of performers, rather than impersonate Cash, guides the audience on a journey through Cash’s storied life and celebrated music with more than 35 of Cash’s hits. – The Squirm Burpee Circus, 5 p.m. Sunday, March 2. An exhilarating, fantastical adventure of classic slapstick comedy, high-skill circus acts and a classic melodrama plot, the Squirm Burpee Circus explodes with high-energy acts such as the Human Cannon, the Ladder of Love and chainsaw juggling, not to mention classic Vaudeville comedy routines, romantic antics and more. – “The Fantasticks,” 5 p.m. Sunday, April 27. Billed as “the world’s longest-running musical,” “The Fantasticks” transcends cultural barriers with its story of love both nostalgic and universal. The story centers on two neighboring fathers who trick their children into falling in love and what happens when the children discover the ruse. The performance is scheduled to star Peter O’Neal, a 2013 graduate of the WCU theater program. The Galaxy of Stars Series is presented by the WCU College of Fine and Performing Arts and with support from the WCU Friends of the Arts organization. Single tickets for the 2013-14 series go on sale Aug. 6. Those prices are $20 for adults; $15 for WCU faculty and staff; and $5 for students and children. Ticket prices are $15 per person for groups of 20 or more and $10 per person for groups of 50 or more. For tickets or more information about Galaxy of Stars events, contact the Bardo Arts Center box office at 828-227-2479 or go online to bardoartscenter.wcu.edu. Free Meals for Kids This Summer – No Questions Asked! ASHEVILLE NC – Summer Meals are now available for ALL kids under 18 – no strings attached! A complete list of Summer Meal sites is attached below. You can also find the most convenient Summer Meal site by calling 1-866-3-HUNGRY or by visiting whyhunger.org/findfood to get a list of all locations within a 10 mile radius. Click here for a list of Buncombe County sites. ASHEVILLE NC – Every year, families are faced with the challenge of how to dispose of medicines that are not entirely consumed. Prescriptions change, symptoms improve, patients die, and individuals fail to take their medications as directed. People are often left wondering what to do with the unused portions. In addition, over-the-counter medications purchased in large quantities often expire before they are used. These medications are usually thrown in the trash, flushed down the toilet or left to pile up in the medicine cabinet. This can lead to drugs contaminating our water supply, accidentally poisoning children and pets, or being stolen for illegal use. A wide array of pharmaceuticals is present in our waterways – hormones, antibiotics, analgesics, antidepressants, and tranquilizers, to name a few. In 1999-2000, the U.S. Geological Survey evaluated 139 streams in 30 states for pharmaceuticals, hormones, and other organic contaminants. They found contamination in 80% of the streams tested. 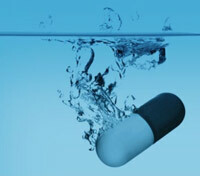 Septic systems and wastewater treatment plants currently in use were not designed to remove pharmaceuticals. Several layers of additional and expensive treatment would be required to remove all of these chemicals from the water. Over multiple generations, the presence of medications in these bodies of water could impact aquatic life, animals, and even humans. Improper storage and disposal of medications can also have tragic consequences for our children and pets. Every year, about 54,000 children under the age of six are treated in emergency rooms for poisoning from self-ingested prescription and over-the-counter medicines. Children are not the only ones at risk from accidental poisoning. In 2011, the Animal Poison Control Center received over 25,000 calls about pets consuming prescription drugs intended for people. Finally, improper disposal or indefinite storage of certain pharmaceuticals creates opportunities for drug abuse. Commonly abused prescription drugs include opioid painkillers (narcotics), depressants prescribed for anxiety or sleep disorders, and stimulants used to treat attention-deficit/hyperactivity disorder, or narcolepsy. In 2009, 16 million Americans over the age of 11 had taken a prescription pain reliever, tranquilizer, stimulant, or sedative for nonmedical purposes in the year prior to being surveyed. Simply throwing these drugs in the trash leaves the possibility that someone may end up using or distributing them in an illegal fashion. Allowing them to build up in your cupboard is not any better. Of surveyed teens who abused prescription pain relievers, 62% had to look no further than their parents’ medicine cabinets. Proper disposal of unneeded medications protects our environment, our communities, and our families. The Buncombe County Sheriff’s Office now offers a drop-off program for safe drug disposal. There is a Pill Drop Box in the lobby of the Sheriff’s Office, which is located at 202 Haywood Street in Asheville. Pills should be taken from the original containers and put into the storage bags supplied at the drop point. ALL PILLS (vitamins, aspirin, pain medications, etc.) can be placed into the same storage bag. They will be incinerated as one item. TAKE YOUR CONTAINERS AND LABELS AWAY WITH YOU. You should dispose of your personal identification information yourself. The plastic containers can be recycled with all other plastics in your curbside or drop-off recycling program. Medications can be dropped off Monday through Friday, from 8 a.m. to 5 p.m. If you have questions about this program, call the Sheriff’s office at 250-4503. ASHEVILLE NC – In a continued effort to reduce waste headed for the landfill, the City of Asheville is restructuring its fees for recycling and solid waste collection. Beginning July 1, the city will replace the $3.50 per month recycling fee with a $7.00 per month solid waste fee. This fee will continue to appear on the combined utility statement and will apply to all customers using the city’s solid waste collection services. The fee change more accurately represents the high cost of waste disposal. Solid waste services use about 80,000 gallons of fuel each year. These costs continue to rise and make it difficult to continue delivering quality service with the same amount of money. Replacing the $3.50 per month recycling fee with a $7.00 per month solid waste fee will generate an additional $750,000 that will be used to further reduce materials going into the landfill through the installation of downtown recycling containers and allow for optimization of solid waste collection routes in order to reduce fuel costs. The City of Asheville’s Zero Waste campaign is aimed at reducing landfill waste. The “Big Blue” recycling carts rolled out in 2012 have resulted in a significant increase in recycled materials in the city. The City of Asheville remains dedicated to reducing its waste and carbon footprint. Looking for a few quick answers? Click here for frequently asked questions. ASHEVILLE NC – Salt Lake City Mayor Ralph Becker and Asheville Mayor Terry Bellamy have been selected as the nation’s top winners in the 2013 Mayors’ Climate Protection Awards, an initiative sponsored by The U.S. Conference of Mayors (USCM) and Walmart. The winners were announced today during the Mayors’ Climate Protections Awards luncheon, which was held in conjunction with USCM’s 81thAnnual Meeting. The annual awards program, now in its seventh year, recognizes mayors for innovative practices in their cities that increase energy efficiency and reduce greenhouse gas emissions. An independent panel of judges selected the winners from a pool of applicants. The Salt Lake City Public Safety Building will be the first public safety building in the nation to achieve a Net Zero rating. To reach this lofty goal and ensure the building produces as much energy as it uses, the city employed a host of innovative technologies including rooftop solar and an off-site solar farm, planned LEED Platinum certification, locally-sourced and environmentally-sound materials and high efficiency mechanical systems. Its Salt Lake Community Solar (SLCS), a unique, market-driven approach to reducing the cost of solar energy using innovation and ingenuity to tackle the logistical and financial barriers of going solar, helps businesses and homeowners purchase and instal solar energy systems. The City of Asheville established a goal to cut carbon emissions in its municipal activities by 80 percent by 2030. In the five years following the adoption of this target, the city has achieved a 17.67% reduction in emissions, and it has also established a self-sustaining funding source that recycles energy savings to invest in additional sustainability programs. More recently, these energy savings and dollars are directed into the Green Capital Improvement Program (Green CIP) which funds the city ongoing initiatives to make further progress on its 80 percent reduction goal. During the worst financial crisis since the Great Depression, Asheville creatively reinvested energy savings to invest in improved greener services for its citizens. Small City Honorable Mentions: Mayor Kathleen J. DeRosa, Cathedral City, CA; Mayor Roy D. Buol, Dubuque, IA, Mayor Nancy R. Rotering, Highland Park, IL, Mayor Jerry Willey, Hillsboro, OR, J. Richard Gray, Lancaster, PA, and Mayor Chris Koos, Normal, IL. Brief descriptions of ALL winning programs can be found at: usmayors.org/climateprotection/2013awardees. ASHEVILLE NC – A-B Tech South, A-B Tech Community College’s newest campus located in Arden, is gearing up to meet local businesses’ needs by hosting a new certificate in Customer Service. The creation of the Customer Service Academy is in direct response to an online survey A-B Tech South administered earlier this spring. “It’s important that as a community college we respond to the community’s needs. The new Customer Service Academy is what our local businesses told us they wanted. The employees who attend this new program will learn how to better serve and keep customers,” said Jason Fair, A-B Tech South Coordinator. The Customer Service Certificate Program will be available this fall and classes will run from September through December. Classes will be held at both the A-B Tech South and Enka sites. Students will choose three out of six courses to complete the program. Topics of the classes include Customer Service Skills, The Art of Motivation, Conflict Management, the Foundation to Exceptional Customer Service, Public Speaking, and Values and Ethics. For more information contact Fair at 398-7716. ASHEVILLE NC – UNC Asheville has earned two national awards presented by the Council for Advancement and Support of Education (CASE), an international professional association for colleges and universities. The Communication and Marketing Department received the CASE, Circle of Excellence Silver Award for its integrated communication and branding program “Seriously Creative.” A Bronze Award in the category of in-house print publications was presented to UNC Asheville for the Admissions Viewbook. These are the first CASE national awards won by UNC Asheville. In February, the university won five district awards from CASE competing against universities in nine Southeast states. CASE members represent 3,600 educational institutions in 76 countries. The Circle of Excellence Awards acknowledge superior accomplishments that have lasting impact, demonstrate the highest level of professionalism and deliver exceptional results. You are currently browsing the Asheville NC News blog archives for June, 2013.